As part of my Master's research, I explored community mapping through researching, reading, speaking with practitioners and coordinating mapping sessions with the intent to further understand how it can operate as a process for helping us learn how to live well where we are. This guidebook is meant to provide those interested in community mapping with the theoretical and practical tools to take it into action in their unique context. 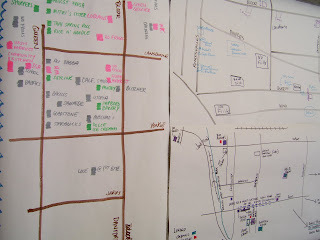 It explains some of the theory and motivations behind community mapping, coupling this with a selection of activities. The guidebook is entitled Getting Here From There, A Guidebook For Facilitators: Community mapping for place-based environmental education, community development and social change by Hannah Lewis. I would like to share an exciting project I have been involved in this past year: The Community Food Mapping Project of the West End Food Co-op, which engaged hundreds of residents of Parkdale/High Park over the course of summer 2009 in twelve workshops producing over 80 amazing community maps. This community engagement project sought to explore, by working with the diverse populations of this neighbourhood, the community food system to consider challenges and opportunities to improve it. Public workshops were held inviting any interested community members to attend, site visits were mapping workshops designed in close consultation with specific community groups to ensure their voices were included, and skills training in community mapping was provided for interested community members in both design and facilitation. Through the workshops we worked with clients of the Parkdale Activity-Recreation Centre, residents of Toronto Community Housing, members of the Canadian Tibetan Association, Greenest City's Youth Green Squad, vendors at the local farmers' market, seniors at Parkdale Community Health Centre, members of St. Joseph's Community Health Centre's Women's Centre, clients of the local farmers' market, and English as a Second Language students at the Parkdale Intercultural Association. We were humbled, excited and enriched by the maps created. A wrap-up workshop in September gave community members an opportunity to review the summers' maps and identify themes to be passed onto a local artist, who will create an artistic rendering of the project's outcomes--this will serve as a mural at the Food Co-op's store but will also be exhibited in the community. For images of the workshops and the maps created, please feel free to browse the albums posted here. To download and view the newsletters, which include findings and action steps from each workshop as well as map images and pictures, visit this website. 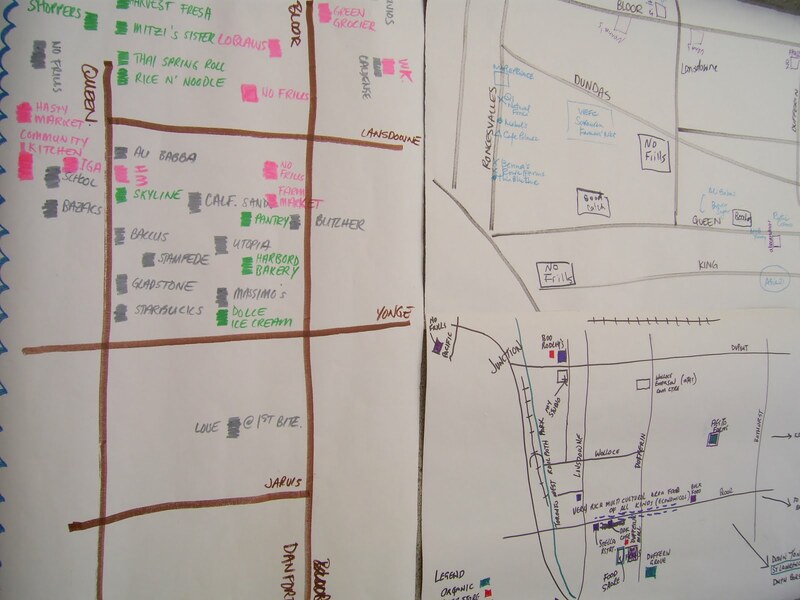 The map-making may be over but the project is not; all of the stories, challenges and suggestions for action from the workshops will be incorporated into the West End Food Co-op's opening in late 2010 or early 2011 and into a community arts piece. Welcome to a space for discussion about community mapping, including how it relates to place-based, environmental education. This 'zine provides an overview of what community mapping is and how it is being done around the world, including quotes, stories, images and more. Please pass this 'zine along to anyone who might be interested and contact me with any questions you might have. I grew up in Vancouver and on British Columbia's beautiful Sunshine Coast. I completed my B.A. at Queen's University in Environmental Studies and Sociology, where I was introduced to community mapping and began to get very interested in the process. I followed this up as the focus of my research for my Master's in Environmental Studies: community mapping as place-based environmental education. This research included a literature review, information book ('zine), interviews with practitioners, a five-month community food mapping project, and the creation of a guidebook for mapping facilitators. I am now working at the UBC Farm in Vancouver, B.C., and doing contract work in community mapping both here and in Toronto.